Dia De Los Muertos by Roseanne Greenfield Thong, pictures by Carles Ballesteros. Albert Whitman & Company, Chicago, IL. 2015. I must admit, when I first learned of the holiday known as Day of the Dead, I was a little taken aback. Walking into a gift shop in Tucson some years ago and being greeted by an array of skeletons, I could only wonder, what was the appeal? Then, ironically, a man who attends Quaker Meeting, where I am a member, introduced the holiday to our Sunday school children. He had made beautiful papel picado, cut paper banners, carefully carved with an exacto knife. I was told this holiday helps people remember their relatives who have passed on and is meant to be a joyous event. The vibrant pastels and deep reds, blues and greens of the illustrations are a welcome relief to the ubiquitous orange and black colors of Halloween. There is a two page addendum explaining the holiday and a glossary assists in understanding the Spanish words. 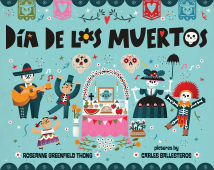 This is a beautiful book and has convinced this skeptic that the Day of the Dead is indeed a joyous and necessary holiday. I couldn’t help but think how this holiday could’ve served my needs as a child, when I lost my father at a young age. Although we remember our loved ones with sorrow, Dia de los Muertos reminds us of the happiness they brought into our lives. I am sure this story will spark fond memories in many children, as well as the adult readers. A very special book.